At first glance, these words don’t seem to go together. When you think of glass, you think of something fragile, breakable. When you think of elephants, you think of (or at least I do) strong, powerful, sturdy beasts with few natural predators. So, what made me think of the two together? 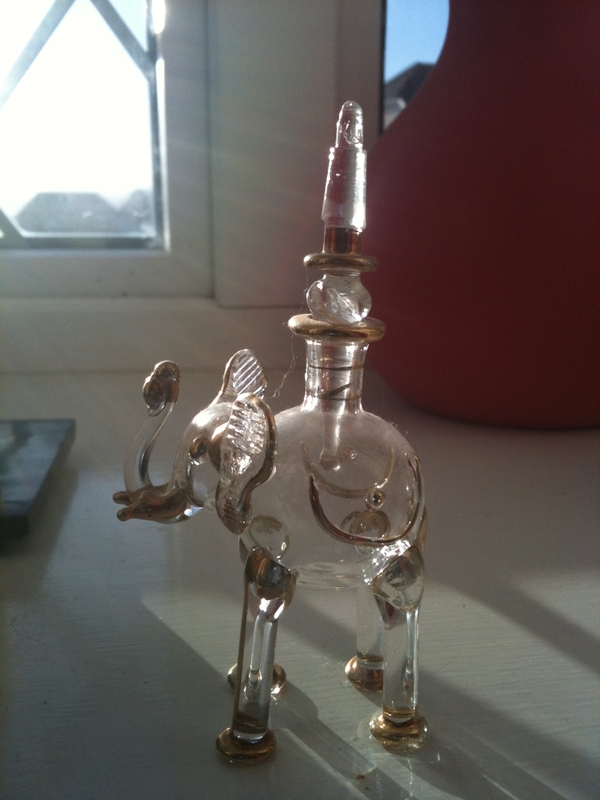 Simple really, I found a glass perfume bottle in the shape of an elephant. Think about other combinations that you wouldn’t normally think of working together, but somehow, they do. I’ll get you started “teddy bear”. Next, try to think of completely random words and find a way to pair them. It can be anything, use your imagination and if all else fails, pick random spots in the dictionary and pull words until you have a nice pool of 20 or 30. Play with language and see what you get. There are some books that have great opening and finishing lines. They’re the ones that grab you to begin with and make you think and leave you inspired at the end. Try this, write an opening line and a closing line. Now connect the dots, what happens in between?